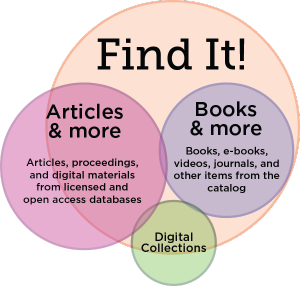 Last December, the Libraries replaced the classic library catalog with Find It!, a single-search box that provides a dynamic “one-stop” discovery and delivery service to the Libraries’ collections and an extensive index of millions of scholarly e-resources, including books, e-books, articles, reviews, legal documents and more. We would like to know what you think of Find It!. We welcome comments using the “Let us know what you think” form from the Find It! homepage. Your feedback is very important to us as we continue developing the Find It! search interface. This entry was posted in Blog, Collections, Libraries, Library Technology, libraryhomepage and tagged Discovery, Discovery Service, Feedback, Find It!, Single-Search Box. Bookmark the permalink.